Tailoring programs offered at fashion design schools may be a part of the standard curriculum or offered as a specialty certification program for students. Tailoring is an important aspect of fashion design that is typically taught in the course of a standard fashion design degree program. Some schools offering certificate programs do so for students who are already enrolled in a program at the school. However, there are independent tailoring classes available for independent students who only wish to learn the art of tailoring women and men’s clothing. Most clothing items do not fit perfectly when purchased from a retail outlet, so people who wish to tailor their own clothes and those interested in starting a consignment business may also benefit from tailoring lessons. Regardless of the reason a person wants to learn tailoring or whether they do so at a fashion design school or through independent classes, the lessons will remain the same. Tailoring classes in a fashion design school fall into courses about basic apparel construction. Fashion design classes in tailoring generally start with a basic knowledge of sewing, both by hand and with a sewing machine. These classes teach students the basics of hand and machine sewing as well as how to assemble patterns to create complete garment. Construction classes will also include coursework in selecting trim fabrics as well as how to properly cut fabrics by hand and manipulate different types of fabrics. Classes on tailoring slacks and vest will cover the process of assembling the garments to provide a thorough understanding of their construction. It will also include trimming and hemming techniques, cutting fabrics, and choosing types of fabric finishes for pants and vests. Jacket tailoring is typically its own class in fashion design schools due to the complexity of the garment. 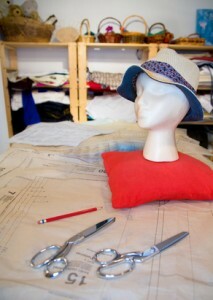 As with all other tailoring classes, it will typically teach elements of construction and fabric choice. A working knowledge of heavier fabrics, including how they react when sewing, stitching, trimming, and other manipulations are applies. Top coats and overcoats may or may not be covered in the class, but includes similar educational elements. Fashion design schools that offer tailoring programs as a separate component of the course curriculum are typically preparing students for a career or job in a tailor’s office or as a professional tailor. They typically incorporate the professional development course work into the classes to draw connection to professionalism and career success. The basic knowledge and principles involved in tailoring, such as construction and pattern assembly, are very much integrated into most classes in a fashion design school and therefore much of the knowledge required to perform the class activities is learned in other courses.